Improve Your Health and Posture with Simple Changes and Exercises | It's not your tech, it's how you use it. If you’re like most geeks – including myself – you spend a lot of time at your computer. Probably too much time. Ergonomics isn’t just some fancy catch word that a consultants use to try and get a few extra dollars out of office managers: it’s important, and when I stumbled onto this infographic over at Lifehacker that explains why sitting is actually slowly killing us, I was stunned. After all, not only do I work full-time in technology, but I’m also a technology writer. It’s not uncommon for me to spend more time at a computer on any given day than I spend sleeping. So what can I do to make sure cheap oakley I’m not dying a slow and hunched-over death? Great question – it’s a question you should ask yourself, too, especially if you spend any significant amount of time at the computer. Well, with the help of a little proper posture at your desk while working and some simple desk exercises, you can go a long way towards making sure you’re overall healthier and happier even if you have to spend the bulk of your day at a desk. That and some regular breaks to get up and walk around? You’re golden. Hit the jump to see what I mean. The beauty of it is that it only takes a few minor tweaks. No expensive new chair, no fancy new standing desk, just sit up straight, slide a little closer to your desk, and pay attention to the angle of your back, neck, and your elbows. If you’re interested in taking it to the next level, over at Dumb Little Man there’s a list of great stretching exercises you can use to stave off bad posture that will help you stay limber and healthy. Some of the stretches, like the Superman, the Reverse Superman, and the Hip Flexors, are stretches you can do anywhere, at any desk, in any work environment. I wouldn’t suggest you start working the posterior chain on the floor at an office where you have to wear a suit, but hey – if your office has that kind of culture, I think a break may be in order. The other important thing to note is that you can tweak your workspace and stretch as much as you want, but none of it is a substitution for getting up and moving around. 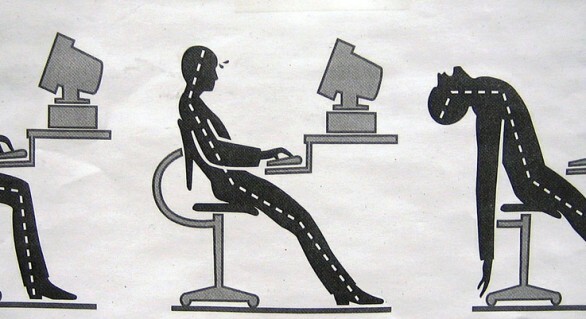 Your body isn’t made to sit in one place for hours upon hours on end. You need to get up and move around: walk to get a glass of water or a drink, go get some face-time with a coworker you like talking to (if they’re not busy, of course,) or just walk a lap around the floor. I keep a bottle of water at my desk for just this reason: I fill it up when I finish the coffee I bring to the office with me every day (you guys know I’m a coffee snob, so I’m not drinking from the cheap oakley sunglasses push-pot we have in the office,) which makes me get up and head over to the water dispenser. Then when I finish the bottle, I get up and refill it almost immediately: it gives me an excuse to get up and move around. Most ergonomics experts will tell you to take a 10 minute break from the computer every half-hour or so, but sadly most jobs would never be that lenient with time away from your desk. I say try to fit it in as often as reasonable and that doesn’t draw unwanted attention to yourself. Between stretches, breaks, and making sure you pay attention to the way you’re seated, there are a lot of little things you can do to make big improvements in your health. Don’t write this one off, give it a try.